It was another exciting week for Jaguar Racing, as it was announced our first Jaguar I-PACE eTROPHY partner is Michelin Tyres. Michelin is joining as Official Tyre supplier ahead of the series debut later this year and will provide tyres for all 20 Jaguar I-PACE eTROPHY racecars at each of the world’s first international championship for production-based electric cars. 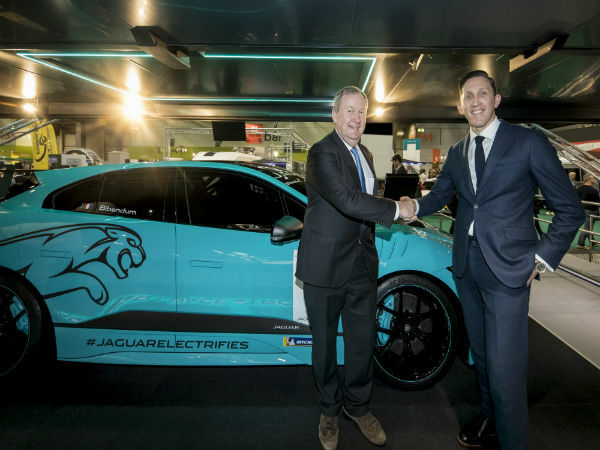 The Jaguar Racing Team Director James Barclay revealed the partnership at Autosport International on 11 January. Michelin supplies tyres to a host of leading motorsport series including the FIA Formula E Championship, FIM MotoGP, FIM Moto-e World Cup, FIA World Rally Championship and FIA World Endurance Championship. The Jaguar I-PACE eTROPHY will now join this impressive line-up. The Jaguar I-PACE eTROPHY is the support series to the FIA Formula E Championship and will take place the same weekend on the same city street circuits throughout the 2018/19 season. The series, which will exclusively feature 20 Jaguar I-PACE eTROPHY racecars, will give teams involved the chance to showcase talent and performance while competing on the world stage in zero-emissions motorsport. Jaguar Land Rover Special Vehicle Operations (SVO) in Warwickshire, UK, are building the racecars and Jaguar Racing are offering ‘Arrive and Drive’ packages for up to 20 drivers commencing in the 2018/19 season of FIA Formula E. The racecars are based on Jaguar’s first battery electric vehicle, the Jaguar I-PACE, which will go on sale later this year. Jaguar Racing’s commitment to electric racing is in line with its strategy that from 2020 all new Jaguar Land Rover vehicles will be available with an electrification option.